For this research, sensors were used to investigate the differences in prestress losses and temperature gradients in a concrete deck bulb tee girder bridge. 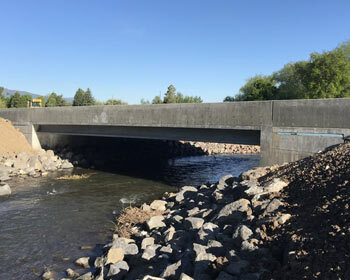 The Millville Bridge was built as an access point to the Ridgeline High School in Millville, Utah. The bridge was built in 2016 and presently supports two lanes of traffic. Changes in prestress were measured with a total of 16 vibrating wire strain gauges located at four cross-sections. Temperature gradients were measured with a total of 50 thermocouples located at five cross-section locations, four of which were shared locations with the vibrating wire strain gauges. These instruments were placed at the mid-span and end of an exterior and center girder to effectively measure the bridge response in one quarter of the bridge superstructure. The prestress loss recordings were initiated before the prestressing strands were released. The thermocouple data for Girder 1 began to be recorded before the initial casting of the girder concrete. The thermocouple data for Girder 5 was started before the curing blanket was removed in the casting yard. Prestress losses at the girder mid-span and temperature gradients were compared with code recommended values according to the AASHTO bridge design specifications. Powelson, Phillip, Paul J. Barr, and Marv W. Halling. Long-Term Behavior of Precast Concrete Bridges , MPC-18-352. North Dakota State University - Upper Great Plains Transportation Institute, Fargo: Mountain-Plains Consortium, 2018.